Was there ever an odder successor to the Sugar Bowl? As the triumphant Louisville Cardinals left the New Orleans Marriott after a 33-23 victory over the Florida Gators, they traded looks of astonishment with gaggle of bow-tie beclad historians checking in for the 2013 Annual Meeting of the American Historical Association. Baseball is more than a game came of bow-tie wearers, anyway (just ask George Will, though he seems to have eschewed the look recently) and it's a John Sayles film festival, complete with a screening of Eight Men Out earlier today, which is playing for meeting-goers. And there were lots of historians today -- the line to register snaked around two corners at the Marriott headquarters. Around five thousand attendees are expected, a number ordinarily expected from a conference on the East Coast. Perhaps it's the theme of the conference, "People, Spaces, and Stories." Perhaps it's the city of New Orleans itself, with a balmy climate and a deep, rich history dating to the beginning of the eighteenth century. Or perhaps it's more recent, more painful history. And while it's true that New Orleans historians are engaged both with the local community and the broader scholarly community in remembering -- and studying the remembrance of -- Hurricane Katrina (though there's only one session this year, out of over a dozen on local history, dedicated to post-Katrina New Orleans), the hurricane devastated the city a scant seven years ago, hardly time for the pain to have healed. As at every AHA, there are nearly a dozen different tours out to local historical sites -- and New Orleans certainly doesn't want for historical sites, spanning from slave markets to the French Quarter to the National WWII Museum -- but none are specifically about Hurricane Katrina. The closest was a tour led yesterday by Tulane historian Richard Campenella entitled "The Historical Geography of New Orleans." "We will visit key sites of the Katrina-induced flood," the description read in the AHA program, "but will otherwise contextualize the 2005 catastrophe within the 300-year-history of the city -- this is not a disaster tour." Still, with a conference theme like "People, Spaces, and Stories," the singular event of Katrina will no doubt be on many minds. Also on many minds is the current state of history and higher education, partly spurred by the AHA's Tuning Project on undergraduate history curriculum. The very first numbered AHA session of the conference featured a roundtable of history department chairs from a variety of regional state universities and small liberal arts colleges from around the country, addressing the challenges facing them, their faculty, and students -- including slashed budgets, labor disputes, and difficulty in attracting majors. Matthew Loayza, chair of the history department at Minnesota State University, Mankato, bemoaned that economics departments attracted majors by not only citing job placement statistics, but also starting salaries. Certainly, the spectres of Governor Scott Walker, who slashed the budget of the University of Wisconsin system by nearly a quarter of a billion dollars, and Governor Rick Scott, who recently called for the University of Florida to raise tuition for humanities students, haunted the room, but cautious, if restrained, optimism ultimately carried the day. (Not an easy task, either, given the overwhelming construction noise during the discussion -- both panelists and audience conducted themselves with remarkable aplomb, and the AHA has promised that the construction noise at the Sheraton will be a non-issue by tomorrow.) Suzanne Pasztor, chair at California State University, Humboldt, argued that history departments need to get used to continuously making the argument that history is teaching their students solid, marketable skills for today's knowledge economy, but was confident it is an argument historians can make successfully. Tracy Leavelle seconded Pasztor's broader argument: it's time to stop defending history from business and science departments, he said, and go on the offensive arguing not why history is relevant but what history offers. Later, at the Roosevelt Hotel, former headquarters for flamboyant Louisiana politician Huey Long (this being a history conference, there will no doubt be many "share our wealth" jokes), a distinguished panel featuring David Blight, Thavolia Glymph, Thomas C. Holt, Kate Masur, and Rebecca J. Scott convened to discuss various aspects of the Emancipation Proclamation on its 150th anniversary, its legacy (or rather, legacies), and, perhaps most importantly, the realities of emancipation in the war-torn United States, which did not neatly fit the narrative of freedom come 1863. And yes, Kate Masur talked about her now-famous broadside in the New York Times launched against Stephen Spielberg's Lincoln during the Q & A. Even scholars not present are generating insights, material, and even controversy from and about the AHA. Michelle Moravec, a professor at Rosemont College near Philadelphia, is running a sociological survey via Twitter and Google Docs on the respective number of minority panelists at the AHA and the concurrent Modern Language Association conference in Boston. "One of the lessons I’ve learned from studying the women's liberation movement is how damaging all white panels are," she wrote on her blog. "After one particularly uncomfortable discussion in a group I did not create, I decided that I’d not willingly create anything that included only white people. ... I’m not at the AHA (or the MLA) but I’d LOVE tweeps to tweet if they are in panels that are homogenous as part of an effort to highlight the need to transform history." Thursday's plenary, "The Public Practice of History in and for a Digital Age," was the sole AHA session to be covered by C-SPAN this year, and based on Twitter reports it did not disappoint. (We'll post a link as soon as the video is available.) Special mention must be made of John Fea, who has outdone himself livetweeting the plenary: " This session is really helping me connect my childhood passion to be a journalist with my eventual vocation as a historian," he tweeted, and indeed most of the conversation focused on the different ways and means that historians and journalists tell stories. Tomorrow's keynote address by outgoing AHA president William Cronon is simply entitled Storytelling. On a lighter note, the AHA announced the winners of its "Name that Cocktail!" history cocktail contest today -- New Orleans is, after all, the cocktail capital of America. The Revise and Resubmit, the Tweed and Tonic, and the Passive Voice will all be available at the Roosevelt's Sazerac Bar (highly recommended for its wonderful Art Deco aesthetic), the Sheraton's Pelican Bar, and the Marriott's 55 Fahrenheit. Those with a hankering for cocktails from history would be advised to check out the Sazerac Bar, and perhaps quaff a Ramos Gin Fizz, Huey Long's favorite drink and invented at the very establishment. Finally, a sad note: it was announced Thursday that pioneering women's historian Gerda Lerner passed away January 2. Based on the Twitter reaction, many revellers here in New Orleans will be raising their first glass to her tonight. The 2012 election is now history. Well, it's not yet History -- as the second inauguration of Barack Obama still lies about two weeks into the future, election 2012 is still very much in the realm of journalists, pundits, and politicos as opposed to historian's. But given the monumental nature of the election -- some have called it a realignment election -- it's not too early for historians to offer their take. This afternoon, the AHA sponsored a presidential (that is to say AHA presidential ) panel on the 2012 election, moderated by AHA executive director Jim Grossman, featuring a wide range of political and historical opinions and interpretations, including (*gasp*!) the viewpoint of a Republican! One of the frequent complaints from the left (and frequent criticisms from the right) before the election was that Barack Obama was becoming a retread of Jimmy Carter. But he proved himself to be no Jimmy Carter by the simple virtue of having won re-election, Laura Kalman (of the University of California, Santa Barbara) reminded the audience in a fiery and impassioned speech. She herself feared that Obama, particularly in the aftermath of Benghazi, would prove to be a retread of Jimmy Carter. But that fear -- as well as the truisms that "no northern Democrat was (re-)electable, no incumbent could win with unemployment so high, etc. were exposed as bromides. But what if Obama had lost? The 2008 election would have been dismissed as an anomaly, Citizens United would have been seen as a curse instead of a blessing in disguise, and Obama would have been Jimmy Carter. Even as it played out, the election was close, victories in nine out of ten battleground states notwithstanding. So why was voter turnout less than in 2008? Voter suppression? Disillusionment with Obama's policies? (Kalman certainly expressed disappointment with Obama's continuation of Bush-era war policies and his lack of working-class economic bonafides.) And why did Romney lose? Was he unlikeable? Incompetent? Was it the demographics? These are the questions on everyone's lips, but the answers remain elusive, a matter for future historians. Wilentz also argued that Romney was not a bad candidate, per se, or at least not as bad as liberal pundits claimed. Romney actually ran ahead of down-ballot candidates in some key states. Also, the white vote was far less monolithic for Romney. Though Appalachia and other parts of the South overwhelmingly went against Obama, in the North, especially the cities, the white vote was much more balanced between the two candidates. During the election, Wilentz said he had offered this analysis: Romney had to go so far to the right during the primaries, he would find it hard to tack back to the center. A good first-debate performance gave him a boost and surprised Obama, but that was ultimately a blip (and it didn't help him with crucial demographics like Hispanics, either). If Romney had won the election, he would've been in even bigger trouble anyway, since he would have found his position -- elected as a moderate Republican president -- untenable, as the Republican Party would not have accepted a moderate Republican president. The simple truth is, as Wilentz consistently argued, there's a problem with the GOP itself, not just one or two candidates. Will the Republicans shift toward the center in the face of defeat? "That would fly in the face of history," Wilentz said. For the past twenty-five years, the GOP has steadly shifted from the center-right to the right to the far-right, and there's little reason to think this trend will change. Republicans moved to the right after defeats in 1992 and 1996, and though George W. Bush campaigned as a "compassionate conservative," he governed as a Texas conservative even before 9/11. When he moved more toward the center in his second term, he enraged the right wing of his party, and "the history of the Tea Party began here." In both 2008 and 2012, John McCain and Mitt Romney were both establishment Republican candidates fundamentally out of touch with their base and were forced to tack to the right with their vice-presidential candidates. "Even the Heritage Foundation, a think tank," Wilentz said with some trepidation in his voice, "has taken on Tea Party favorite Jim DeMint as its head." Nationally, Wilentz concluded, the modern Republican Party has begun to resemble the Democratic Party of the 1880s and 1890s, a regional party limited to the South and parts of the West. William Inboden -- the sole Republican on the panel -- argued that the election cemented the bipartisan victory of the Bush-era foreign policy of warrantless wiretaps, extraordinary rendition, and drone warfare, which has encountered remarkably little domestic opposition. "I'm a Republican," Inboden said, "and the game my Republican friends often play is ask, 'what if Bush had done this?'" The issues that were so controversial in 2004 have become essentially bipartisan by 2012. "The public is essentially onboard with the 'war on terror,' or whatever we want to call it these days." This evolution has antecedents in the 1950s, when newly-elected Dwight Eisenhower largely adopted Harry Truman's containment doctrine, and in the 1990s, when Bill Clinton basically embraced the first Bush administration's China policy (and George W. Bush and Barack Obama went on to do the exact same thing). The broad point is that strategic policy that is continued by a successor administration from the opposite party is essentially codified as bipartisan consensus. Turning to religion, Inboden noted that this was probably the first time in American history there was not a single WASP on a major-party ticket, and that represented the final step in the dissolution of the Protestant establishment and the triumph of a nonsectarian civil religion. Fifty years ago, right-wing Protestants vigorously opposed the possibility of a Catholic president; today, it's a nonissue to have a Mormon in office. Why? Certainly abortion and the culture wars are important in this story, bringing together disparate religous creeds and movements, but there's also a broader move away from defining religious differences along doctrinal lines and redefining faith as shared common values. Mary Frances Berry, in feisty and blunt remarks, first declared her profound respect and admiration for Jimmy Carter -- who was something of a straw man foil to Obama in Kalman's and Wilentz's remarks -- then went on to baldly state, "I lost interest in the election last summer, when I wrote an article in Politico last summer criticizing the Democrats for Swift Boating Romney with the Bain issue" -- and it was very effective, and sealed up the election for Obama. The real meat of her dedicated remarks, though, was on the subject of voter suppression, drawing on the story of local Louisiana voter fraud, freely practiced by both Republicans and Democrats. Voter suppression and voter fraud related to corruption have a deep and abiding history in the United States. But Democratic emphasis on Republican voter suppression efforts was a very effective turnout strategy, particularly among African Americans, amongst whom the term voter suppression evokes memories of Jim Crow, the Klan, and night riders. But in terms of actual votes suppressed, 2012 pales in comparison to what happened in Florida in 2000 -- just before Christmas, a Senate panel heard arguments about how to prevent the voter suppression efforts that didn't actually happen in 2012, but did happen in 2000. What are the implications of this election for how we talk about social justice, someone from the audience asked during the Q & A. "That's not what this election was about," responded Sean Wilentz. "It wasn't about poverty." "Poverty was not on the agenda, the wage gap was not on the agenda," agreed Berry. "Campaigns are about who are we targetting to try and get their vote. That's why everybody said 'middle class, middle class' every thirty seconds," she went on. "Everybody in America thinks they're middle class." "The only place it did come out," Wilentz countered, "was that 47 percent business." But "it is indeed true people want to get 'stuff,' " Berry said, and it's a great conundrum of American politics, she continued, to try and pay for all that stuff. "No one has an adult conversation about these sorts of things." There was also serious disagreement between Berry and Wilentz over the future path of the Republican Party. Citing the way Bill Clinton transformed the Democratic Party, Berry repeatedly argued that it's a mistake to count out the Republicans as a permanent minority party. They will find a candidate eventually, she said, that will moderate the party platform -- particularly on social issues -- and be capable of winning a national election. Wilentz was skeptical, given that the GOP base does not reward -- or even allow -- moderation amongst national Republican politicians. At this evening's plenary, Richard Gilder, co-founder of the Gilder Lehrman Institute of American History, was awarded the Theodore Roosevelt Woodrow Wilson Public Service Award for his generous work in promoting the study, teaching, and preservation of American history. In his acceptance speech, Gilder spoke proudly of the work the Gilder Lehrman Institute has done in preserving important documents in American history. Next, the AHA awarded its nineteen book prizes: the full list of winners can be read here. Then came the big guns: William Cronon, with his much-anticipated keynote address, simply (and enigmatically) entitled Storytelling. The American Historical Association, Cronon began (after a brief aside on the different genres of AHA presidential addresses), is an advocate for all kinds of history. The end of Cold War saw the end of alignments that allowed for public support of education and the humanities; other economic and cultural shifts and the ossification of American society further threaten the support of public education that the historical profession is dependent upon. "Make no mistake, very few of the infrastructures supporting the work of historians in the second half of the twentieth century have been unaffected by these trends," he declared. The mission of the AHA, therefore, is paramount in supporting and defending the interests of historians. "Then there's the Internet," Cronon continued. "The book-length monograph upon which our discipline has relied" is under immense pressure, he said. "My deeper fear is watching my own students, who no longer read books for pleasure. If they have any prior experience of doing research, it's online. If a piece of information cannot be Googled, it effectively does not exist for them. ... [Long-form] reading itself is at risk." Students simply are no longer familiar with the basic skills of reading and researching critically. "In a distracted world where even undergraduates at top universities are hard-pressed to read books that [historians] have traditionally written, and there is widespread public doubt" about the study of history as it is traditionally understood, "what is the future of history?" How, in other words, do professional historians defend the study the practice of history? Cronon's answer: Storytelling. "We need to remember the roots of discipline and keep telling stories. ... though the shape and form of our stories will surely change to meet the needs of our digital age." Part of the problem is that professional historians -- professional academics as a whole, really -- speak in their own jargon when communicating with each other, and thus tend to wall themselves off from a broader audience. (Cronon wrote about this back in March.) But Cronon argued that the past is an inherently interesting story, to understand the current world and reclaim worlds lost. "Our core business is RESURRECTION: to make the dead past live again. ... Other professionals can afford to be boring. We cannot." Cronon then went on to quote AHA president Carl Becker, who spoke about this theme in 1931: "Berate him as we will for not reading our books, Mr. Everyman is stronger than we are, and sooner or later we must adapt our knowledge to his necessities. ... The history that lies inert in unread books does no work in the world. The history that does work in the world, the history that influences the course of history, is living history, that pattern of remembered events, whether true or false, that enlarges and enriches the collective specious present, the specious present of Mr. Everyman." 'So how do we make the past come alive to Mr. Everyman?' Cronon wondered. By telling stories. But storytelling as a craft is all-too-often neglected by professional historians. There are good reasons for this, since, as Mark Twain may or may not have said, "Never let the truth get in the way of a good story." Historians can't afford that kind of cavalier attitude, but there are alternatives. Michael Pollen has spend a quarter of a century researching Americans' interactions with food, using journalistic techniques pioneered by George Plimpton, where the narrator's education also becomes the reader's education. "He has made ... topics more engaging to the reader than ever before." That's why he's the most widely-read food policy writer in the United States. Cronon also spoke admiringly of the storytelling abilities of the filmmaker John Sayles, who combines a meticulous attention to historical fact with the ability to bring the relevance of history to his characters. But the tools available to historians are more constrained than those available to Pollen or Sayles, in no small part due to the too-long-unquestioned third-person omniscient narrative which was cemented in the historical field at its beginning in the nineteenth century. "History is just as committed," Cronon concluded, "to its own peculiar narrative forms. Historians chose not to represent certain aspects of the past to which their documents are silent." But because so much of the experienced past -- in particular conversation and stream-of-consciousness -- are impossible to replicate through documents, historians might have a little bit more respect for the alternative narrative forms of fiction and narrative journalism. But the single most important mission for historians, he reiterated at the close, is to tell stories about the past, and bring the dead past to life again. Much breath was spent talking about the crises facing history today: the crisis in higher education, the crisis in primary and secondary education, the crisis in publishing, the crisis in periodicals, the crisis in archives, and a bevy of others. Panels with titles like "Exploring a Range of Careers Outside the Academy" have been relatively commonplace at the AHA for at least the past five years. Indeed, it has been the more or less professed goal of the AHA for at the least the past five years to bring the historical profession into the twenty-first century -- kicking and screaming if need be, because the pressures that face historians and their traditional mediums are simply not going to go away. 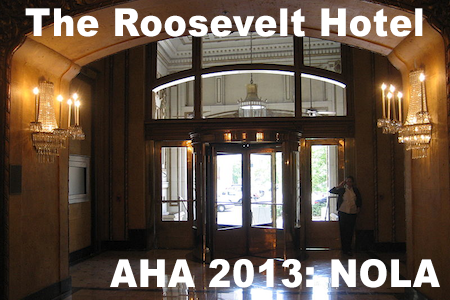 So, was new ground broken on this front at the AHA this year? The answer is a qualified yes, largely because of William Cronon's provocative keynote address on Friday, parts of which could've been appropriate on a Bob Dylan album (during his protest, "The Times They Are A-Changin'" period, not the "Rainy Day Woman #12 & 35" period). Obviously, this ongoing paradigm shift within the historical profession has been the subject of considerable conversation in sessions, on Twitter, and -- most revealingly -- in bars with loosened lips. Younger historians tend to be more supportive of the ideas put forth by Cronon and other reformers (Dan Cohen, for example): an emphasis on narrative, communicating in an interactive way with a broad audience through the Internet, etc. But, until this "new" approach to history translates to hires and promotions, even supportive younger scholars are either going to hedge their bets by conducting traditional, monograph-driven research, or seek a career outside of the academy (John Fea has gone so far as to call on the AHA membership to elect a president who does not work at a research university in order to better represent vast majority of historians who don't work at R1s, either). That's not to say that monograph- or academic article-driven research cannot be innovative or even disruptive: a case in point is the growing environmental history subfield of climate history. A series of three panels on Saturday presented some of the latest climate history research, the most provocative of which was "Climate Change and Big History: From the Origin of Modern Humanity to the Little Ice Age." Instead of phrases like "historiography," "narrative," or "construct," the terms "orbital eccentricity," "Intertropical Convergence Zone," and "Heinrich event" were used freely, so much so that the panel could easily have been mistaken by a layman for a biogeography conference. Queen's University Belfast professor Bruce M.S. Campbell brought the conversation back to a context more familiar (and comfortable) to historians by talking at length about a single year: 1258. 1258 was the year of reportedly harsh weather and famine in England, according to surviving chronicles, and archaelogists, geologists, and geographers have connected the famine to a volcanic eruption near the equator which occured that year, possibly by Mount Rinjani in Indonesia. But, as Campbell pointed out, the historical record does not necessarily support that interpretation: the English chronicle of Matthew Paris also notes that 1256 and 1257 were bad harvest years, and that English manorial records actually indicate an increase in population from 1257 to 1263. Geologic events that occur within the span of recorded history, Campbell argued, can and ought to be interrogated by historians using historical sources. Paleo-environmental studies can pin eruption events and the like to within a few years, with the margin of error increasing the further back one goes. But historical documentation can pinpoint the catastrophic eruption of the Peruvian volcano Huaynaputina to February 19, 1600, because someone -- in this case, a Spanish conquistador -- witnessed the event. This is not mere windowdressing -- historians, argued Campbell, can provide these kinds of insights that are of great value to physical scientists. Another kind of cross-disciplinary session took place on Sunday, the concluding roundtable of a series sponsored by the National History Center entitled "Historians, Journalists, and the Challenges of Getting It Right." A panel of consisting of journalism school professors, editor of the New Orleans Times-Picayune/NOLA.com Jim Amoss, Wilson Quarterly editor Steven Lagerfeld, and History News Service editor David Nord dissected the decline of the daily metro newspaper and potential alternatives to the format. Oddly, historians seemed almost more perturbed by the decline of the newspaper than actual journalists -- Amoss, though acknowledging the difficulties facing the Times-Picayune, especially its recent change to a semi-daily print edition and the severe downsizing of the staff, was nevertheless optimistic that Internet journalism, though it requires a different style and way of thinking that newspaper journalism, can nevertheless fulfill the same kind of community-building role. The historians in the audience, on the other hand, were more concerned with the loss of the actual object of the newspaper, both for nostalgic reasons (this is the profession which, as William Cronon said in his keynote, has been wedded to the book-length print monograph as the sine qua non of academic seriousness for over a century) and, more importantly, for reasons of record. Internet journalism, by its very nature, is ephemeral and subject to frequent revision and correction (at the risk of being self-reflexive, this blog either has been or probably will be revised in some capacity), and while from a journalistic perspective this can be a great blessing, for the precision-driven historian, it makes life much more difficult than the simple microfilm. But journalists are finding ways to adapt to the new environment and make the most of the new medium -- everyone in the room, audience included, spoke admiringly (and perhaps a little jealously) of the the New York Times project "Snowfall" as the new gold standard in Internet journalism. Though obviously few news organizations can match the resources of the Times, the feature offers a blueprint for the way forward online for journalists. There do exist online blueprints for historians -- Zotero has been around for quite some time, after all. But perhaps what's needed -- and what the AHA was certainly pressing for at the 2013 Annual Meeting -- is the same kind of consensus journalists had over "Snowfall": that one particular project/mode of thought/form of presentation represents the next step forward for the historical field. There are certainly many candidates.